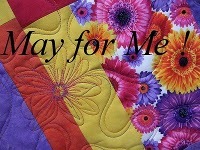 Happy Happy Saturday everyone – did you know that TODAY is National Quilting Day? I hope you all find some time to get to your sewing machines and create something amazing. I already let my hubby know that it was a must for me to get down there today. 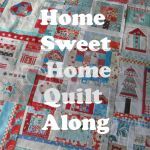 My little ‘mini’ challenge is for you to get on your sewing machine and quilt something fun for YOU! Sarah B with her piece ‘Geese at Sunset’! Congratulations Sarah! 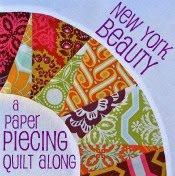 You’ll be taking home $10 to SpiceBerryCottage andDownloadable Quilter's Cookbook 2009 from the QuiltingGallery! And now we’re moving onto our Judges Choice. Judge 1: First, go for the passport. It opens up a whole lot more of the world! I like the bag a lot. We have had a number of bags but this one is so original and so wonderful. I just like it a lot! What more can I say. Judge 2: Wonderful bags. I like the interpretation of the artwork. 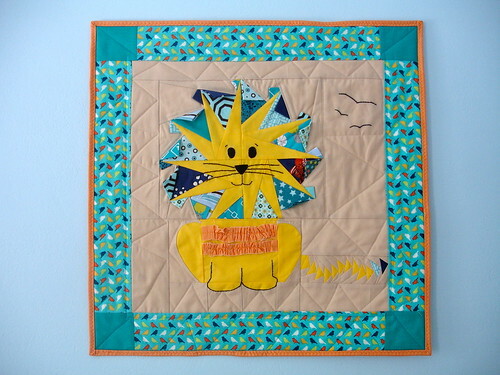 As usual, your quilting is amazing. Great choice for the back. At first glance I thought this didn’t have the complementary colors, but I see it does. Judge 3: Wow, what a fantastic design! I love the Escher style, and you balanced the white and black and color accents beautifully. I like the rich tones of the yellow/orange with the blue/violet. The simple reverse triangle on the back side works well. 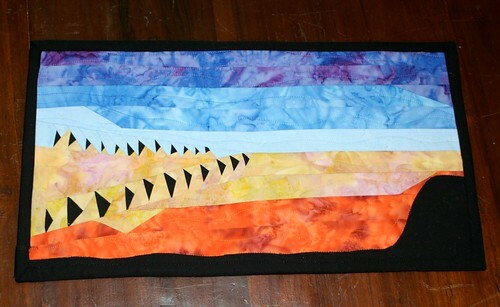 I love the wavy quilting stitches that give an energetic contrast to the geometric triangle shapes. The extra passport pouch is nicely done with the little accent triangles. SpringWaterDesigns and her piece ‘Geese of Gettysburg! Judge 1: Love the story and the colors have great meaning. I love the real geese. The only thing I think may have added to the project is a small border or binding. This may be my personal taste but I really love the project. Judge 2: This is a beautiful design. You’ve used the complementary color scheme very effectively and the gradated colors and sizes give it great movement. 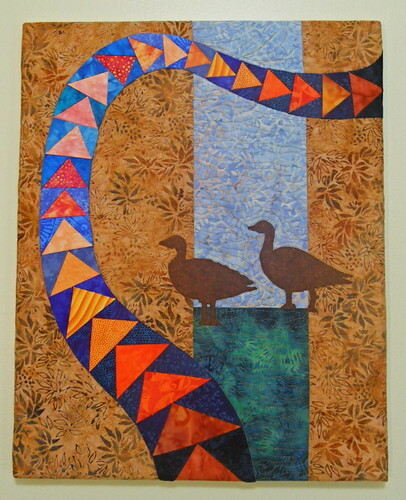 I love that you added real geese by the water and the quilting is very effective. Judge 3: Your curved flying geese are really well done, and the use of many shades of orange gives excellent depth to the path. I love the goose silhouettes against the watery colors. The overall balance in the design is very pleasing. I like the choice of the thread color for quilting, and your decision not to quilt over the flying geese path lets it really pop. Judge 4: Great piecing, great composition! Wonderful! I don’t have any suggestions on how this quilt could be improved further. And now…first place from this weeks Judges, with an average score of 9.15 goes to…. Dashasel with her piece ‘That’s Not my Lion’. 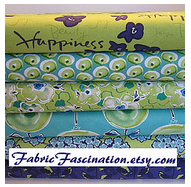 Congratulations on winning $10 to FabricsNQuilts and $10 to Dye Candy. Judge 1: I give you so much credit for the originality of your piece. 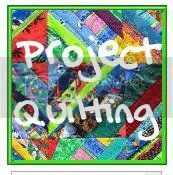 I love that the piece doesn’t scream “Flying Geese.” That is so wonderful and so unexpected and that is what I love about judging for Project Quilting. Judge 2: I so love the way you always do something that is unexpected. You explored a traditional block for the first time and didn’t do it at all in a traditional way, but took 2 different more complicated interpretations and used them to create something wonderful. I am truly amazed at how far you have come technically. This is beautifully done. You have obviously taken every suggestion I ever made and followed through on it. Judge 3: What a fun, happy piece! I love the many little details in the hand stitched birds, whiskers and face. The 3-d effect of the prairie points is marvelous, and the ruffles add a lot of interest as well as balance to the 3-d elements in the overall design. 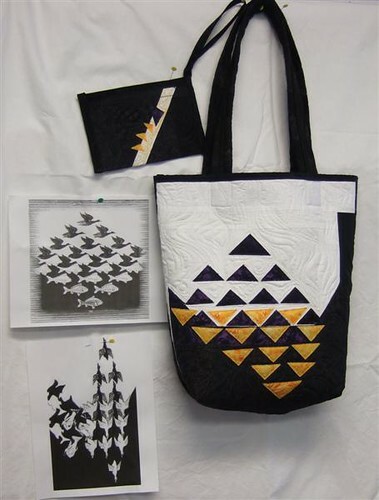 Your simple triangular quilting is fitting, and doesn't compete too heavily with the focal point. 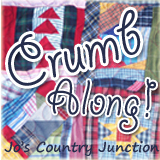 Judge 4: What a fun project! Adorable! I’m sure your son will cherish it for a long time. You’ve brought together many different techniques very successfully. The hand stitching is a nice touch. Great job. A big thanks to our Judges this week! I’m sure what you do is not easy but I also know we all appreciate some honest, constructive criticism on our pieces. 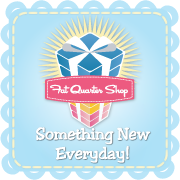 Stay tuned later today to see if you won a randomly drawn prize or Pattern & Notecards from Marcia's Crafty Sewing & Quilting for this weeks Public Comment Prize!